I found this circular stating that 17 F&O contracts will have a reduction in lot size and 48 will have an increase. How does this affect my existing positions in these contract? When a contract undergoes an increase in lot size, it is applicable to the new contracts introduced(In this case, Jan 2019). However, if there is a reduction in the lot size even existing positions held in the current and near month will be affected. The reduction in lot size is usually done in whole ratios to accommodate for calendar spread contracts and easy rollovers. For instance, Bank Nifty was revised in a ratio of 2:1(Lot size of 40 became 20). If the revision in the contract is not a multiple of the lot size, the contract will not have calendar spreads for the revised month. Existing contracts will have no effect on the change in lot size. New contracts will be available in the increased lot size. Calendar spreads for the revised month will not be available. In this case, Dec 18- Jan 19 spreads. Why do exchanges revise the lot size? SEBI mandates that the contract value of all F&O contracts remain between 5 to 10 Lakhs. In the periodic review(every 6 months), if the contract value of a scrip is beyond this range, there is an upward or downward revision in lot size. As part of the periodic review there has been revisions made to the lot sizes, effective from 26th April, 2019. 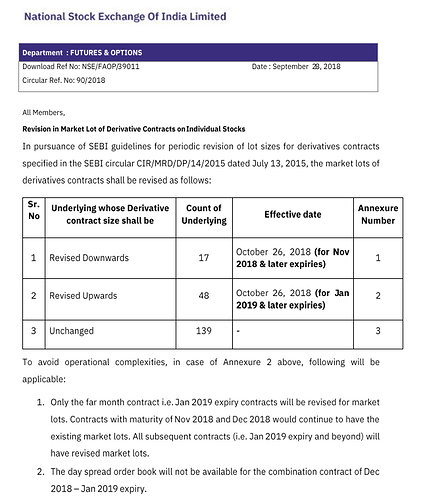 The lot sizes of 43 contracts have been revised upwards, and 5 contracts have been revised downwards. Only the far month contract i.e. 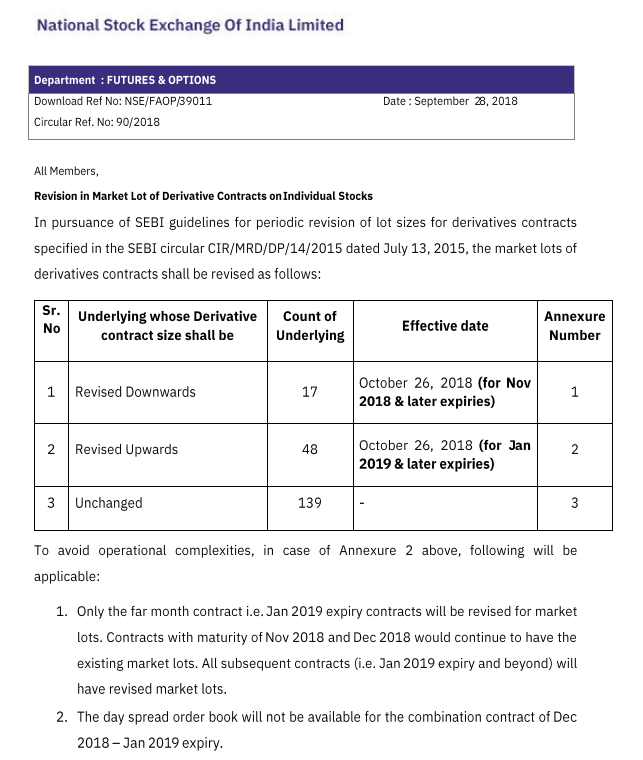 July 2019 expiry contracts will be revised for market lots. Contracts with maturity of May 2019 and June 2019 would continue to have the existing market lots. Calendar spreads for the revised month will not be available for the combination contract of June 2019 July 2019 expiry. Check out this circular from NSE for more.